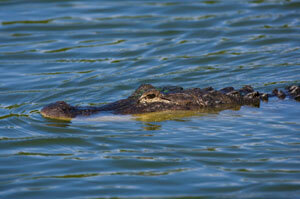 Ahh, Texas Alligators – ya gotta love 'em. Those big old prehistoric critters with their slaphappy tails have provided many Texans with hours of entertainment, as well as that eerie feeling of being stalked from somewhere just beneath the water. Every river log floating by can trigger a chain reaction that reverses toe dangling to toe tucking and hoofin' it off the riverbank. Maybe that's why we like eating them so much. My first gator experience was watching Charlie the Alligator who lived at Holiday House Hamburgers in Austin. But, gator cuteness quickly faded during college in San Marcos, once home to Aquarena Springs Amusement Park. In the early '70s, the park's Texana Village flooded, and they lost their alligators. Don't bother asking how many escaped because, like the gator itself, that number seems to have grown in storytelling over the years. Anyway, I was relieved when I heard that Tom Allen of the TV show "Mutual of Omaha's Wild Kingdom" had rounded 'em all up. It was when he said "plus one", my future inner tube floats down the San Marcos River were ruined, but then the movie "Jaws" has kept me beach bound, too! So, I decided to write this article in honor of the American alligator, the only gator family species native to Texas and nine other states in the United States. Texas not only has gator farms where they raise alligators for hide and meat, but we also have a "core county" alligator hunting season September 10-30, which coincides with GATORFEST in Anahuac, the Alligator Capital of Texas, a title given to the town because the alligators outnumber the people 3 to 1. But, seriously, alligator is an exotic meat with a mild flavor and tender texture, similar to chicken, or a mild white fish. I can't really decide which because the meat takes on the flavors of ingredients you incorporate while cooking. And get this -- aside from tasting great, alligator meat is also healthier than all other meats including chicken, because it's low in fat and cholesterol, but high in protein. The tail and jaw have white, tender meat that is perfect for any kind of cooking whether you grill, fry, broil, bake, or stew. The body and leg meat has a bit stronger flavor and is darker and tougher, but still great if you marinate or tenderize it before cooking. You can generally find frozen tail meat at specialty seafood markets where it's sold in 1-pound packages at a price that varies between seven to ten dollars per pound. Texas offers several places to find alligator meat, like Quality Seafood in Austin where owner Carol Huntsberger specializes in just about any seafood that you can think of and is really helpful in getting you what you want. Fiesta Mart is also in Austin, and will ship for you. If you're searching through the phone book, look under "Grocers" and those who specialize in seafood. If they don't carry what you want, they'll probably know who does. If you're surfing the Internet, type in "specialty seafood", "alligator meat", or "exotic meat", and include your city or state. Once you get your gator, it can be kept in the freezer for up to three months. And, when you're ready to cook it up, just thaw it overnight in the refrigerator, or place it in a watertight bag and set it in cold water, changing the water often until thawed. Now, I'm not big on microwave defrosting, but if that's the road you want to take, set your microwave on the defrost cycle and allow 2 to 5 minutes per pound. Finally, before I pass along some really tasty recipes, remember that in the state of Texas, it's an offense to feed free-ranging (that means loose) alligators. I don't know if that includes dangling your feet in the water or not, but just to stay on the safe side of the law, keep yer hands in yer pockets and toes in yer boots! Now, let's cook up some Gator! Set the meat out and bring it to room temperature before cooking. Rinse the alligator tail and pat dry, then cut into 1-inch cubes. Preheat oil in deep fryer or skillet to 350°F. Sift together all dry ingredients and beat in water until smooth. Dip alligator pieces into batter, covering completely and place into hot oil. Deep fry until golden brown, about 3 to 4 minutes. Remove and place on paper towels to drain excess oil. Serve with Ranch Dressing, or Remoulade Dipping Sauce. Makes 2 meal-size servings or appetizers for 4 to 6.. In a medium-size mixing bowl, blend mayonnaise, mustard, Worcestershire, Tabasco, onions, celery, parsley, garlic and lemon juice. Place Remoulade sauce in refrigerator for about 1 hour before serving. Slice alligator into thin strips, or 1-inch cubes and sauté in 2 tablespoons of the olive oil until tender, and set aside. Add remaining olive oil to a large, heavy saucepan or Dutch oven. Over medium heat, sauté onions, bell pepper and garlic until onion is tender. Stir briskly to prevent garlic from browning. Add tomatoes, bay leaves, Habanero pepper, salt, pepper and thyme. Simmer over low heat for about 5 minutes. Add chicken stock and rice to the vegetables, cover and simmer for about 20 minutes, finally adding the alligator and simmering for another 5 minutes. Remove from heat and serve. Makes 2 to 4 servings..